So without further ado, let’s understand it. We can use a Short Call Strategy when we are bearish in the market or a particular type of underlying and we expect the prices to fall. In this strategy we sell the Call in the assumption that the underlying will come down sharply. This position offers limited profit potential and the possibility of unlimited losses in case the rates of the underlying increases significantly. We can use this strategy when we are bearish about a particular stock or index. The reason for using this strategy is that there is a high probability for success when selling very out-of-the-money options. Limited profits. Maximum profit will be the premium at the time of writing (selling) the call. NIFTY is currently trading around 8400. Let’s assume you are extremely bearish on NIFTY. 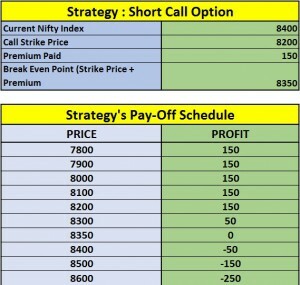 So you sell one lot of current month Call with 8200 strike price at a premium of Rs. 150. We use this strategy when we highly expect a fall in the price of the underlying. But his is a risky strategy as our profits are extremely limited (Rs. 150 in this case) but the losses are unlimited as we tend to lose a lot of money if the underlying index or stock keeps moving up. Therefore this strategy should either be used when we are certain that the underlying will go down or with a stop loss. 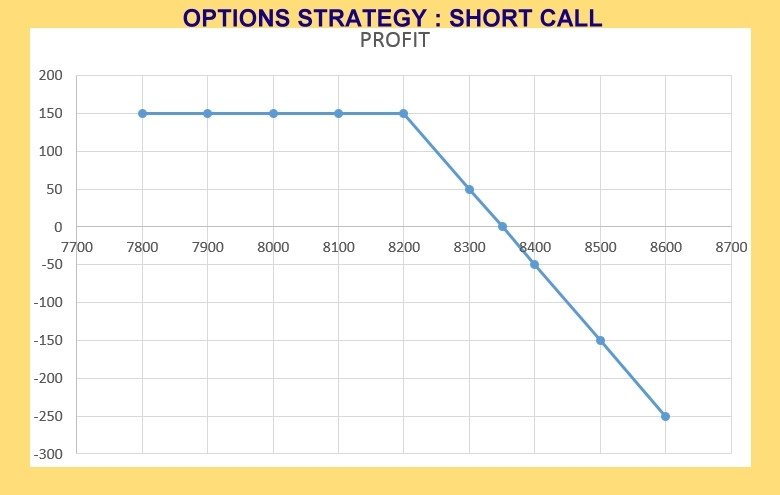 We hope that you are finding our new series on Options Strategies Informative as well as interesting. We will soon come up with another strategy, so stay tuned and keep leaning. Have a happy time trading folks.